How did you first know you wanted to be an occupational therapist? I have wanted to be an occupational therapist for most of my life. I grew up in rural Minnesota, and while I was in elementary school, one of my classmates was unfortunately involved in a farming accident that resulted in a tractor running over his skull. He was airlifted to Mayo Medical Center in Rochester, MN, where he made an incredible recovery from his TBI. He did continue to have some cognitive deficits related to frontal lobe damage — and needed a lot of OT. I loved how the OT services he received enabled him to return to school and participate in the things he loved. I was hooked. I decided then to be an OT and have never changed my mind. I am a proud Boston University graduate. What clinical settings have you worked? Your favorite? Your least? I am still a recent graduate, having been in the field for less than 5 years. My primary clinical experience is working in a long-term acute care hospital with a focus on oncology and complex medical care. I loved my time working with those populations. How/when did you decide to transition to a non-clinical role? After practicing for about 2 years, I transitioned to a part-time clinical and part-time academic role as a fieldwork coordinator at an entry-level OTD program. After a year of part-time in both settings, I transitioned to a full-time position in academia. Transitioning into academia was more of a 10-year plan thing (after working for maybe 5 years, getting my doctorate, applying for jobs . . . ). However, when the opportunity presented itself, I jumped at it and just made it work! Now, my 10-year plan looks much, much different. What steps did you have to take? Honestly, I was contacted by one of my OT mentors and former professors. She had switched jobs and was looking for help in getting the fieldwork program up and running. I had to of course interview and say “yes” to the offer — but mostly stay flexible about what the new job would look like! The way I got this role is networking. My mentor (and now boss) was aware of what my career goals were, and I made sure to stay in touch with her after I graduated. This allowed my name to be considered when an opportunity presented itself. If I hadn’t let her know I was interested prior to the opportunity arising, I don’t think she would have thought about me as an option. I absolutely love it! I definitely could make more money as an OT with 5 years experience, but I really want to gain the experience in academia, so I happily make the trade-off of less pay for the opportunity. The program I work for was able to offer a fairly competitive salary, though, which was important to me as a new graduate still paying student loans. I am also able to make up some of the difference in income by working per diem on the weekends. It is a great supplement to my income. Did you have any extra training or CEUs? I knew that I wanted to work in academia as a fieldwork coordinator when I was practicing as a clinician. Because that was my goal, I made sure to take the Fieldwork Educator Course from AOTA and supervise both Level I and Level II Students while I was working. The other thing that I did was expand my network and experiences. For example, I helped run a research study through a clinical scholars program at my hospital. I applied for and was accepted into AOTA’s Emerging Leaders program. I attended local fieldwork conferences. Experiences like these helped build my resume and skills and enabled me to contribute to an academic program in a more meaningful way. It is also important to note that because I work for an entry-level OTD program, and I only have a master’s degree, my role is a staff role (not faculty). I am currently working on my post-professional OTD to allow me to take on more faculty responsibilities. Having a doctoral degree is really important for anyone who wants to move into academia full-time! 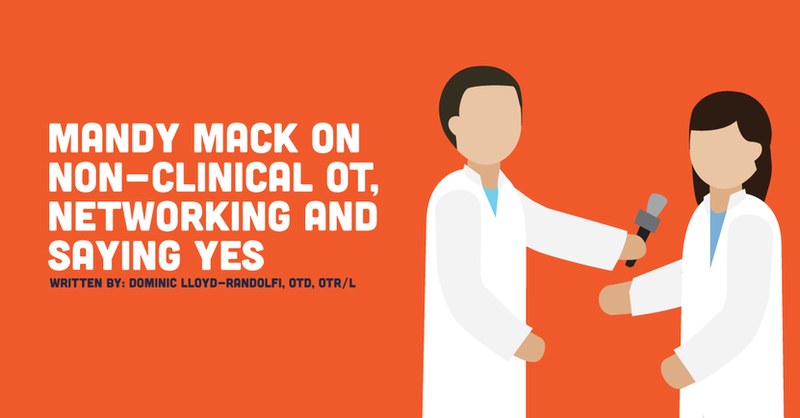 Pros and cons of your non-clinical OT job? The pros: I get to do what I am most passionate about: working with OT students! I also love the support I receive for continuing education, research, and leadership development. I feel challenged to continue to grow and learn, which is important to me. I was feeling a bit bored in my purely clinical role. Finally, the flexible schedule is a HUGE perk compared to the hospital, especially since I have a young daughter. The cons: I loved building relationships with clients and their families and I miss working one on one with them. I also hate that I sit so much — I was a much more active person (and felt better!) when I was moving and treating clients all day. I’m also one of the youngest people in the academic setting, which makes it a bit hard to build relationships with co-workers sometimes. Find a mentor. Jobs everywhere — but especially in academia — are often dependent on who you know. Find someone who is invested in helping you develop and helping you meet people within their network. Stay in contact with those people. The more people you have on your “team,” the more opportunities you will encounter. Let everyone know what your career goals are. If people don’t know what you are looking for, they can’t help you get there. Telling supervisors, colleagues, former professors, etc. about your goals allows them to connect you with opportunities that may arise. Say “yes” as much as possible. Obviously you don’t want to burn yourself out, but you have to be willing to try new things and work hard. Apply for that program. Volunteer to help with that research study. Put forth the effort to take a student. You don’t know how those experiences and connections may help in the future.